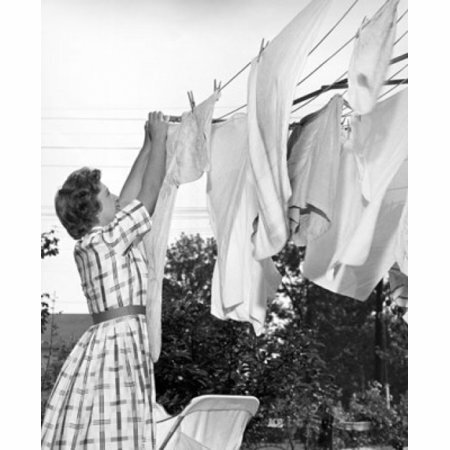 Mother had a clothes line where she hung clothes to dry. Many times I had to hang clothes up with wooden clothespins when I was a kid, one chore I didn’t really care for. Later on as a young teen, I remember sometimes going to the laundromat by Eddie’s grocery and washing several loads at once, drying in the big dryers, where the sheets especially came out fluffy and more wrinkle-free. When I married, we had a brand new washer and dryer from Sears. No more hanging out clothes on the clothes line for me. If I added a little Downy, then I could get by without ironing. I was hooked. When I had kids, I always made sure I bought permanent press that needed no ironing. If something was wrinkled I’d tell the kids to throw it in the dryer with a Bounce sheet and “fluff” it. The only time I ever ironed anything was when I was sewing, or when we were attending a special event. Weddings, funerals, high school graduations. We have an invitation to a wedding. One of these days, whether by the Lord’s return or by death, those of us who have been born again will enter the Lord’s presence. We will be part of those who go to the Marriage Supper of the Lamb. “Blessed are those who are called to the marriage supper of the Lamb!” Rev. 19:9. NKJV. Our garments need to be prepared for Christ’s return, cleansed by the blood of Jesus Christ the Lamb of God and the water of the word of God, but also prepared by our service and good works for Him. When I see Jesus, I want to be presentable, with my best clothes on, garments that are spotless, fluffy, unwrinkled, pure and holy before the Lord.